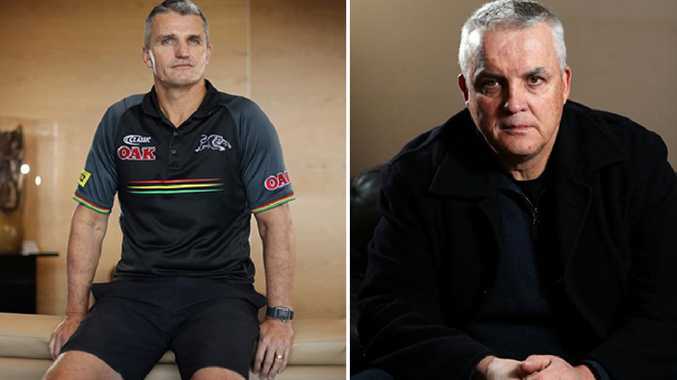 Ivan Cleary and Anthony Griffin. 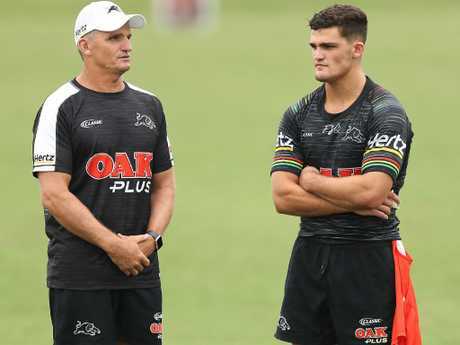 Ivan Cleary has put the ball back in Penrith's NRL pre-season with players noticing a shift from Anthony Griffin's long running sessions to a more game-focused approach. Three months after he left the Wests Tigers, Cleary will coach Penrith in a match for the first time in three years in Saturday's NRL trial against South Sydney at Redfern. Besides swapping halves Nathan Cleary and James Maloney to opposite sides of the field, the coach's most notable pre-season impact has been longer and harder-hitting skills sessions. "Each coach has their own way of how they want to coach ... The pre-seasons that we've had under Hook (Griffin), probably just the running aspect was s**t," prop Reagan Campbell-Gillard told AAP. "Over the past few years we've had a Monday and a Friday with fitness and no ball. You front up to maybe 7km of just running and that's your session done before you come over and do weights. "Now you're actually doing fitness with a ball in hand. I've always been a believer of it and having previously been coached by Ivan that's what I'm used to." Last season's pre-season is understood to have been a point of contention at Penrith which culminated in Griffin and Phil Gould's confrontation during the first pre-season trial last February. After his sacking as coach, Griffin claimed the two had words over a lack of focus in the team's attack as he opted to play his forwards unchanged through the first 40 minutes of a trial against Canterbury. Penrith regularly stormed home late to win games last year but were ranked just 11th for completed sets. In turn, Cleary has held regular long ball work sessions since his arrival in November, with a no-holds-barred approach often taken in defence. "It's a no brainer," Campbell-Gillard said. "We train with a ball, we're not marathon runners and we're not in the Olympics to train for a 2.5km run. "Our trade is to play with a football ... It helps to try and catch a ball under fatigue, it's going to happen. "It's things like that, scenarios that are actually going to happen in a game." The players are believed to have felt the brunt of the strategy with a number of minor contact injuries but all expected are to be fit to face Parramatta in round one.